Motorcycle theft is absolutely a real risk. More than 45,000 motorcycles are stolen each year in the United States. Most are never found, because they are parted out or rebuilt to obscure their true (stolen) identities. If you have a bike you love, protect it with these motorcycle theft prevention tips. And if you’ve already taken motorcycle anti-theft measures, double-check them to make sure they’re as good as they could be. For the most part, there are two kinds of motorcycle thieves: opportunistic thieves and planners. The opportunistic thief just happens to see your motorcycle and takes it right then and there. The planner targets your specific motorcycle in advance, after deciding on the right time and place to do it. You are protecting yourself and your motorcycle against both of them, so that’s why it’s smart to mix up these motorcycle anti-theft tips. Remember, in the unhappy event that your motorcycle does get stolen, you need all of your information at hand. Make sure you have all of these things written down: the license plate number, the make and model of the bike, the year of the motorcycle, and the VIN. Also be sure you have photos of the motorcycle, because the police don’t want your 1,000 words. The less time your motorcycle is sitting out somewhere on display, the fewer chances opportunists have to take it, and the less likely it is to be targeted by a pro. Cover it, or keep it inside whenever you can. Yeah, a custom bike looks really cool, but it’s also really easy to identify. Yes, it might still be targeted, but it’s a much tougher thing for a thief to get away with—and they know it. Be careful every time you park, and choose a spot you can see from where you’re headed if at all possible. If that’s not an option, park right under a security camera. Hint: even if you can’t see any, there are always cameras at ATMs, banks, jewelry stores, and most supermarkets. If all else fails, choose a well-lit spot where your motorcycle is in view of many people. Speaking of keeping your motorcycle out of sight and parking carefully, as you approach your home or destination, watch your mirrors. If a pro is targeting your motorcycle, they’re likely to follow you for awhile so they can determine when and where to strike. Don’t lead them right back to your house; wait until they pass you, lose them, or better still, drive right to the local precinct. If you’re not sure whether that person is really following you, do a U-turn. If they’re still there, chances are great that they’re following. Your steering lock is your first line of defense, so use it—but don’t stop there. Use a quality alarmed disc lock too, on your back wheel. Next, to ensure that no one just lifts and takes your bike, add an asymmetrical cable lock attached through the frame to something that’s totally anchored like a street light something or extremely heavy like a pylon—off the ground if possible to ruin a thief’s leverage. Seeing these locks is a deterrent for many thieves who will just look for an easier target. And don’t forget to take those locks off before riding off (assuming that it’s possible to ride off without doing it). Don’t leave your key in the ignition, even for a minute. And don’t hang them near your bike at home! A motorcycle can get stolen out of a garage very easily. Finally, write down your key numbers, and if they’re stamped onto the locks, file them off so no one can make another key. Even if a thief has a key, if you’ve got a hidden kill switch they can’t start the motorcycle. The same goes for hotwiring it. Even if the thief knows that it must be a kill switch, they can only flip it if they can find it. Or, if you’d rather, take a fuse off your bike and bring it with you; no one’s going to have one on them. Use a GPS tracker on your motorcycle in case all of your careful efforts fail. Make sure it’s well hidden. This way, if the worst happens and your motorcycle is stolen, the police will know right where to find it. 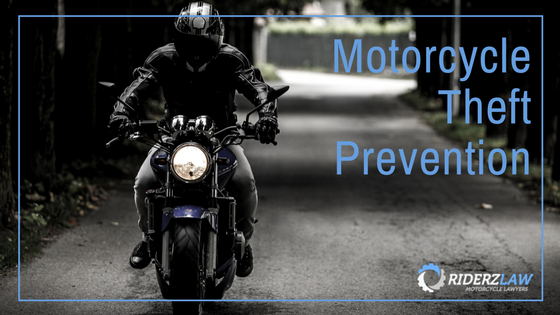 There are lots of things you can do to improve your odds of keeping your motorcycle, even in a time when a motorcycle gets stolen every 12 seconds or so! Follow these motorcycle anti-theft tips for protecting your bike, and it’ll be yours for a lot longer.